Shall we ever meet its like again? So long, Vampire Classifieds. We hardly knew ya. Click here to view an archived version. Picture: Anthony Hogg. Greetings vampire fans! I hope you are doing well. It has been a while since we have spoken or I have written anything for Vamped. 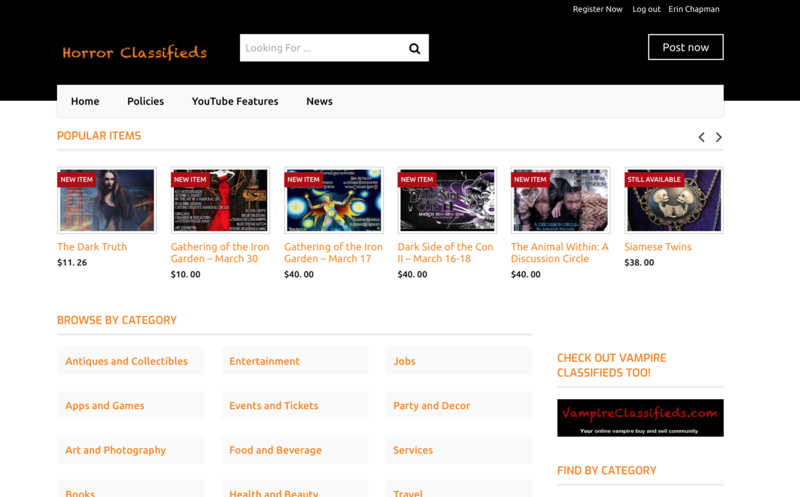 Anthony suggested I make an official announcement on Vamped about the closing of my two websites: Vampire Classifieds and Horror Classifieds. This made sense to me as we did announce when they were open for business back on August 10, 2017. Sitting in front of my laptop, having the screen stare back at me, I’m debating what to say and how much context is needed that led me up to this decision. My friend, Dea Schofield, says writing is therapeutic and perhaps this is what I need right now. For those of you that don’t know me, the past couple of months have been a personal struggle for me, emotionally and physically. 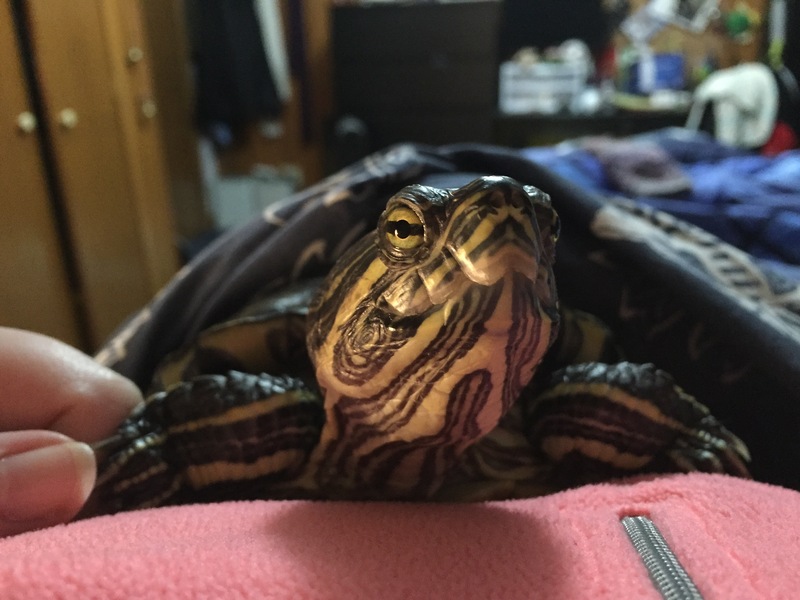 My best friend, Zack, a turtle that I have had for the last twenty-two years of my life passed away on June 14, 2018. He became sick earlier this year and the vet determined he had cancer in his digestive system in two places. Yes, turtles can get cancer like people. He was in a lot of pain and the humane thing to do was put him to sleep. This was the hardest decision of my life and I did what would be best for my friend and baby. My mother paid for Zack to be cremated and now he sits in an urn on my desk where I can see him everyday. Zack was my security blanket, my rock, and the only constant from my life for the last twenty-two years. No matter how my day was or how I was feeling, he would give me a cuddle and make everything okay. Zack was very domesticated and roamed the house free like a dog or cat. Zack getting cuddled in bed, one of his favourite things. Picture: Erin Chapman. I miss him every day and my heart is still broken and raw. I have spent countless hours and days over the last few months crying and even writing this, makes the tears come again. What made this the hardest was any time over the years when I have had to deal with a death of someone, Zack was who I turned to and now this time, when I needed him the most, he was gone. I abandoned everything I usually do in my life. I stopped going to the gym and yoga. I stopped writing and reading. I took a week off work. I basically numbed my pain sitting alone with my thoughts or watching television. I have another turtle, Zebbie, but he was never as sociable or affectionate as Zack because he has spent most of his seven years in his aquarium due to having issues with his eyes when he is out of the water. He has seen the vet about ten times over the years for this problem. Only last month, due to antibiotics and a another vet visit, we finally figured out he needs artificial tear eye drops whenever he is out and then he is fine. Zebbie and me enjoying a little sun this summer. Picture: Erin Chapman. My mum suggested getting another turtle and my significant other disagreed and wanted me to wait and grieve for Zack. I wanted to see if I could find a new turtle before I made a decision. They are illegal to sell, but legal to have to British Columbia so the only way to find one is a private sale or through a shelter. This makes the chances of getting a baby very slim. I contacted a turtle rescue shelter that the vet referred me to. They had twenty-six turtles available and unfortunately the youngest was four years old and they all had been neglected or abused in some way. 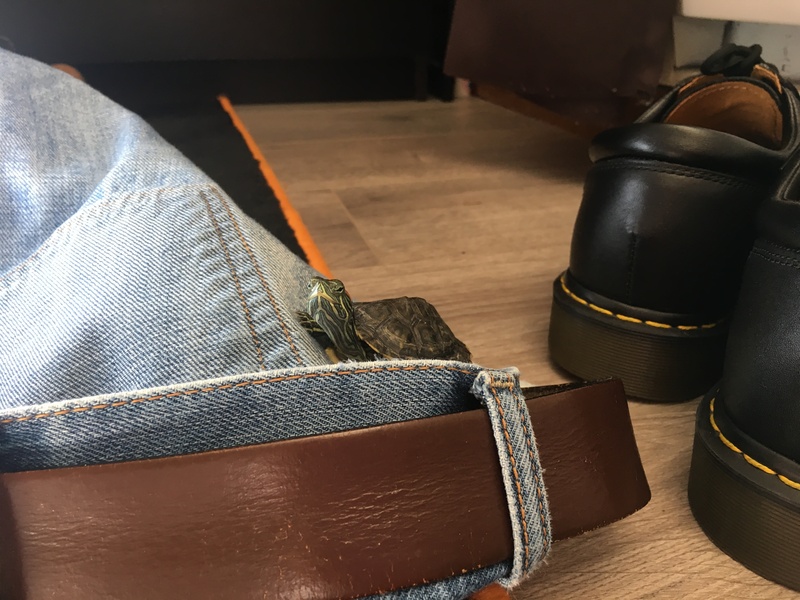 I also stumbled upon a advertisement on a buy and sell site, Kijiji, that a woman was selling a baby red-eared slider turtle that she didn’t want. The only downside, was she lived a few hours away. The shelter recommended I take the baby that was for sale as the shelter ones already had a good home. On June 25, 2018 after nine hours of driving and travelling by a ferry, we welcomed Watson to the family. Full disclosure, I am a Sherlock Holmes fan. My other half wanted to call him Doogle and still does. When I picked up the little guy his tank was filthy and he was covered in poop. At that point, I knew I had done the right thing by rescuing him. As you can see by the photo below, he was only about a month old when I got him and he weighed only twenty-five grams. Meet Watson. Compared to the shoes and belt, you get an idea of how tiny Watson was when we got him. Picture: Erin Chapman. My goal with Watson is to have him be more social like Zack and spend most of his life outside of an aquarium. So far so good with this. He loves running around and when I come home he asks to be let out. He loves climbing anything he can find, including pant legs. This little guy helped me get over my loss and still does every day, but he will never replace Zack. It took me a few months to start to even feel slightly normal again. Instead of crying each day, I was down to a couple of days a week. I still wasn’t ready for the gym and not back to my old self yet, but I was on my way. I finished designing a new website in only two weeks that I had contemplated for a while: Morbid Planet. This was a big deal as it was my first solo project where the content was article based. Up to this point, I had only worked on Vamped with Anthony, Vamped‘s editor-in-cheif and my friend. Morbid Planet showcases the extraordinary and mysterious world of dark tourism, while highlighting unique people and macabre things. Our goal is to create a community and centralized resource for fans which will enable them to explore our morbid planet from their phone, tablet or computer. Going on a trip and looking for a specific place? Make sure to browse our Deathly Destinations! Check back daily for new content and let us satisfy your morbid curiosity! This type of subject was something I have always been interested in and it made sense to me. It also gave me a new creative outlet, one that branched a little away from vampires, but let me include vampires if I decided to do so. This topic had a broader reach than vampires and a wider audience where I could share interesting stories with others. I published a bunch of articles and they were a hit with people. On social media, people were talking and sharing experiences from visiting the locations I covered. This made me happy. Then out of the blue in late August, my only grandma was admitted to the hospital for stomach pains. She is eighty-seven years old and has survived cancer like three times and a multitude of other health issues over the years. Once in the hospital she contracted a serious infection, Clostridioides difficile, while they were trying to figure out the stomach issue. She stopped eating for two weeks and we thought she was going to die. My mother was driving to the hospital daily at lunch trying to feed her and check on her, which is 45 minutes each way. I went each night after work and attempted the same tasks. My drive took up to the same time or longer some nights. Her condition was contagious and when you visited gloves and other preventative measures were required. She kept going downhill and randomly one Sunday I got a call from the doctor on shift saying my grandma has had a stroke. This was the last thing we expected to happen and were given no reason or explanation. It affected her entire left side including her mobility and vision. Her short term memory is also gone. Before going into the hospital she was able to get around anywhere with her walker and since being admitted, she hasn’t been able to stand alone, get out of bed and even feeding herself is a struggle. She can no longer even operate a knife and fork. At least she still knows who we are, which I am thankful for each day. It has been eight weeks of visiting the hospital daily and we are getting extremely tired. My mum is retired, but I also work forty hours a week on top of the nightly visits. She is still there and struggling each day and we don’t know what is going to happen yet. We are just doing what we can to make her happy. This leads us up to now. With no time to work on my projects or self care, I have been contemplating what is a priority and what isn’t. What do I want to spend what little free time I have on? 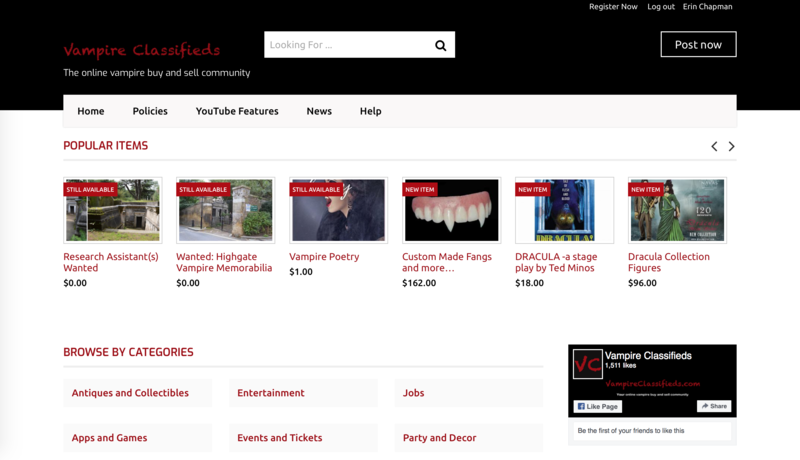 I created Vampire Classifieds to give people a platform to help sell what they have made or created. I see too many people in online communities with fantastic products and no means or skills to help get them into the marketplace where buyers will notice them. I designed the site and put some money into launching it. I made it free for sellers, simple and user automated. People just had to register with an email address and then they could post what items they wanted, as long as they were vampire related. I then shared them on our numerous Facebook groups. Essentially, free advertising and exposure. I anticipated there would be challenges, but the one obstacle I didn’t think of was people are lazy. People didn’t want to make an account to post something. They wanted me to do it for them or people that promised to post content, never did. A site like this is only successfully when you have a lot of content for buyers to view. The more posts, the more views, which will turn into sales for the sellers. Unfortunately, this wasn’t the case. As of closing the site, I had a 114 items, not nearly as much as I expected after having the site live for over a year. Vampire Classifieds. This is the last glimpse anyone will see of the site. Picture: Erin Chapman. I believed so strongly in Vampire Classifieds model, that I invested more money and created a horror genre buy and sell site, Horror Classifieds only a month later after launching Vampire Classifieds. I anticipated this site would do better as the genre is broader, but it did worse and as of closing it, only had 24 items. Horror Classifieds. The last glimpse of Horror Classifieds. Picture: Erin Chapman. I kept both sites running as the operation of them cost me nothing, but time. With fewer new ads being posted, I debated if this was something to keep doing. I made the decision the other week to discontinue both sites and on my day off today, I removed my Instagram accounts, YouTube channels, Twitter accounts, Facebook pages and deleted my email addresses. If you visit either website they are both in maintenance mode now. Essentially, I killed my own work. Being an art student, years ago if I wanted to give up on something, I scrunched a piece of paper and put it in the garbage and my sketch over. This was a different process. I had to erase all evidence that the project existed online. Obviously, I can’t remover things cached in Google, but in time, they will disappear. In a strange way, it felt good to purge these too projects as it opens the doors for new things to come. Being disenchanted with what I was doing was partially due to the stress and exhaustion of personal things that were going on in my life, but it was also not wanting to admit to myself that an idea wasn’t working. It’s not a bad thing, just failure is not something I am used to with endeavors. I always believed if I set my mind to doing something I could do it. In this case, I did the project and figured out the entire design myself, it just didn’t go in the direction I wanted it to travel. I will consider this whole thing a learning experience. Through discussing my ideas with Anthony and Dea, I came up with another model I am going to attempt and design. I will be launching another new site called Morbid Shopping, a spin-off of my site Morbid Planet. This time, I am changing up the model and removing what didn’t work the first time around, the sellers. Morbidshopping.com will be up and running in the next few months and my experiment will start over again. In the meantime, give me a like on our Facebook page. All accounts will be deleted and all information regarding any posts removed as well from Vampire Classifieds and Horror Classifieds. As of today, no one will be able to log back into either of the sites. I wanted to give a huge thank you to all the people that supported this project and posted their items on the site. I really appreciate everything and wish you all a best with your products and events! open for business back on August 10, 2017: Erin Chapman, “Side Project: Here’s Why Things Have Been a Bit Quiet on Vamped Lately,” Vamped, August 10, 2017, accessed October 14, 2018, https://vamped.org/2017/08/10/vampire-classifieds/. 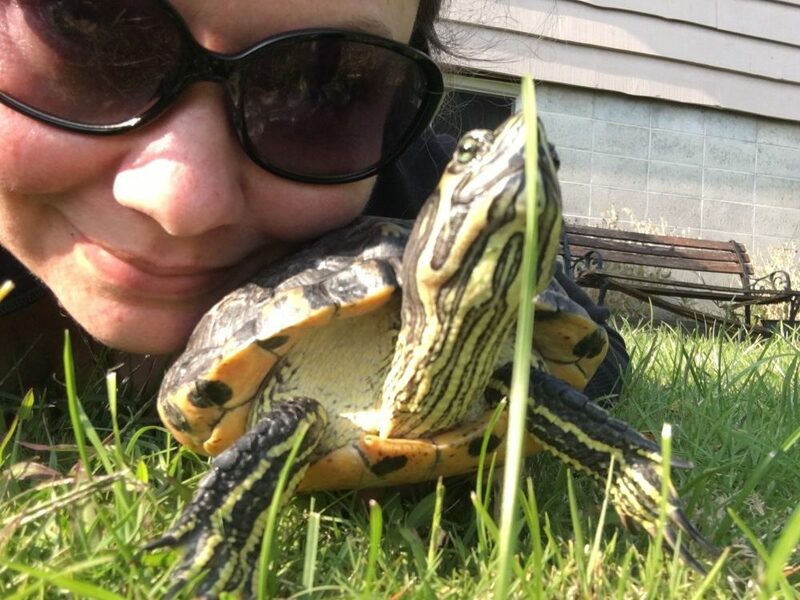 Zack was very domesticated: Erin Chapman, “My 18 Year Friendship…with a Turtle,” Erin Chapman (blog), February 4, 2014, accessed October 14, 2018, https://erinchapman.ca/blog/18-year-friendship-turtle/. give me a like on our Facebook page: https://www.facebook.com/Morbid-Shopping-312114952709431. A shame to see Vampire Classifieds go, but we wish Erin all the best with her Morbid Planet endeavors!